Retractable patio awnings incorporating Sunbrella fabric available in both manual and motorized models. 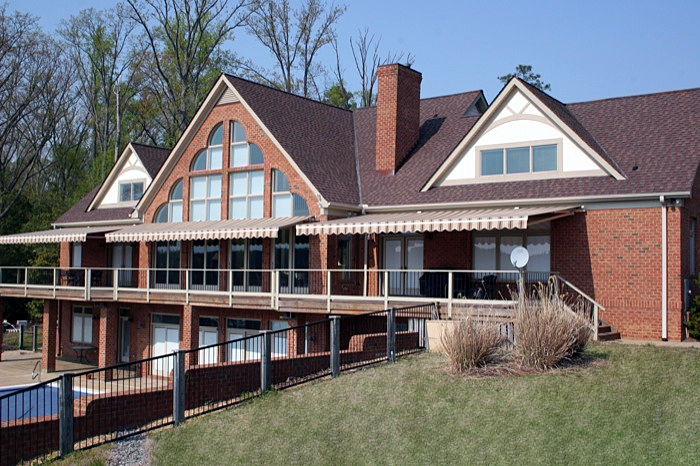 The patio awnings are available in a number of styles, colors and dimensions. The top of the line Sunbrella fabric is placed over powder-coated aluminum frames available in several colors with a multitude of awning widths and a number of different awning projections which are bound to fit almost any size patio, deck or porch. These retractable patio awnings are a great way to beautify your home, add additional outdoor living space and as an added bonus help to reduce your cooling bills. Best of all you can enjoy the use of your deck, patio or porch even in the middle of the noon day sun. All the retractable patio awning models in the Platinum Series utilize the flex-pitch frame which aides in blocking out the direct sun�s rays by adjusting the angle of the patio awning throughout the day by changing the awnings vertical angle. The retractable patio awning models featured in this section all make use of the well known Sunbrella awning canvas in all their available widths and projections. Warranties start out at ten years for the Gold Series frame and go all the way up to twenty years on the Platinum Series frame with the Sunbrella fabric carrying a five year warranty. Optional features include roof mounting kits for low overhangs and weather guards for added protection against the elements. Weather guards are particularly useful if living around salt water areas as theses help to reduce the salt build up on the fabric and reduce the number of times you'll need to wash off the fabric.